Kitchen & Baking Accessories, by The Weed Patch. Cooking tools, measuring cups, citrus juicers, mixing bowls, and more! Anchor Bottle Opener, by Tag. 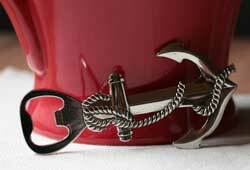 Pretty zinc bottle opener in the shape of an anchor wrapped with rope. Makes a great gift! Measures 1.5 x 4.5 inches. Hand wash only. 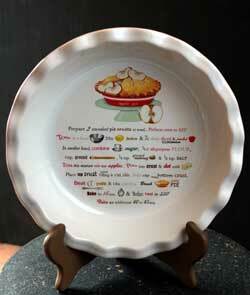 Apple Pie Recipe Dish, by One Hundred 80 Degrees. This deep stoneware dish is cherry red on the outside and white on the inside, with a ruffled edge. Features apple pie images, and an apple pie recipe! Part of the Mary Lake Thompson Collection. Measures 9 inches. Stoneware. Other items in collection also available! The Berry & Vine ceramic collection features hand-painted and embossed designs of stars and whispy berry vines in a black, cranberry red, and toasted cream color palette. This is for the Spoon Rest. 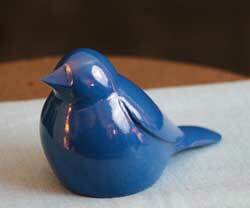 Blue Bird Bottle Opener, by Tag. This adorable bottle opener is crafted in the shape of a songbird to add some whimsy to your celebrations - It's the perfect gift for the nature-loving hostess. Measures 38 x 4.25 x 2.25 inches. Made of polished aluminum. 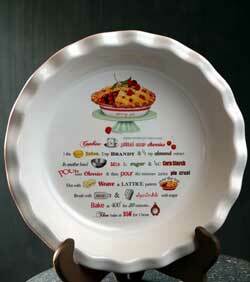 Cherry Pie Recipe Dish, by One Hundred 80 Degrees. This deep stoneware dish is cherry red on the outside and white on the inside, with a ruffled edge. Features cherry pie images, and a cherry pie recipe! Part of the Mary Lake Thompson Collection. Measures 9 inches. Stoneware. Other items in collection also available! 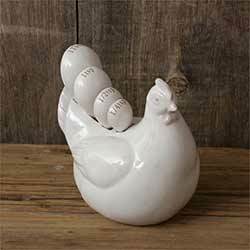 Both decorative and functional, this darling chicken figurine is a holder for a set of 4 measuring spoons. 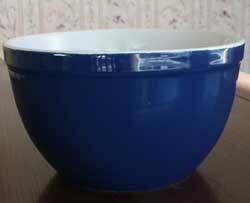 Cobalt Blue Mixing Bowl, by Westwood. Sturdy, heavy stoneware bowl, off-white on the inside, cobalt blue on the outside. 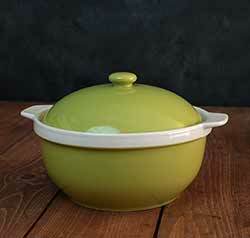 Microwave & dishwasher safe, oven safe up to 350 degrees. Measures 7.5 inches, 72 ounce capacity. 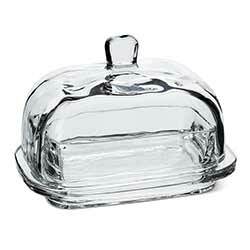 This vintage-style glass butter dish looks great on casual and fancy dining tables alike! Made of beautiful, crystal clear pressed glass. This is for the smaller size, designed to hold a quarter pound of butter. 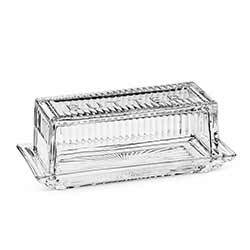 This vintage-style glass butter dish looks great on casual and fancy dining tables alike! Made of beautiful, crystal clear pressed glass. This is for the large size. Green Apple Pie Dish, by Gooseberry Patch. Wonderful country style deep dish ceramic pie plate in apple green with embossed apples on the outside! Measures approx 10 inches in diameter, and 2.5 inches deep. Holiday Stripe Whisk, by DII. Ceramic handled whisk with stripes in light and dark green, and red, against a white background. Measures 11 x 2 inches. Ceramic and stainless steel. Part of the Peppermint Polka Dots Holiday Baking Collection! Other items also available. 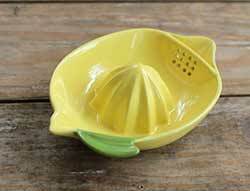 Old fashioned stoneware citrus reamer in the shape of a lemon, a sunny accent to any kitchen! Nested Measuring Cup Set, by One Hundred 80 Degrees. 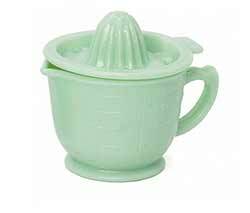 Stoneware retro-style measuring cup set, includes 1 each of the 1 cup, 1/2 cup, 1/3 cup, and 1/4 cup. Part of the Mary Lake Thompson collection. Other items in collection also available! Juice lemons, limes, oranges, and grapefruit with the citrus reamer lid, which fits on top of the measuring cup. Looks just like the depression era glass collectibles! Special order. 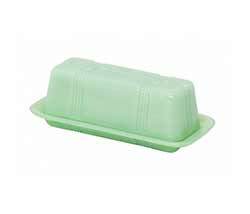 Just like grandma used to have, this jade covered butter dish looks just like the depression era glass collectibles! Special order. 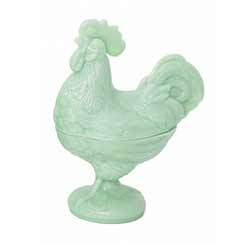 Just like grandma used to have, this jade covered candy dish looks just like the depression era glass collectibles! Special order. 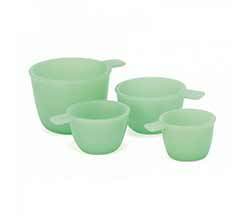 Just like grandma used to have, this jade measuring cup set looks just like the depression era glass collectibles! Build your own family memories baking with your children, and display when not in use for a touch of retro vintage decor! Special order. This reproduction jadeite will have you doing a double take, as it looks just like the depression era glass collectibles! 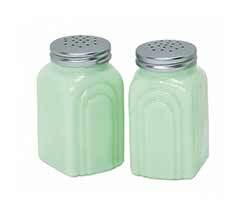 This is for the Salt and Pepper Shaker set. Special order. 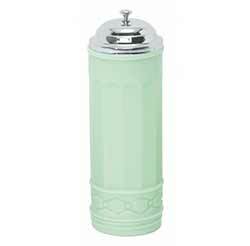 Outfit your coffee station or old fashioned soda shop party supply with this retro jade glass straw holder jar. Looks just like the depression era glass collectibles! Special order. 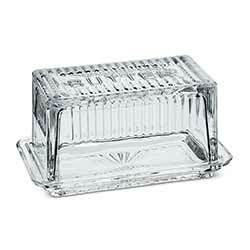 This vintage-style glass butter dish looks great on casual and fancy dining tables alike! Made of beautiful, crystal clear pressed glass. This is the measuring cup set you've been looking for to fit your country farmhouse kitchen! Simple and clean in style, made of white ceramic. Burgundy Marble Small Colander Enamelware, by Crow Canyon. Enamelware is stainless steel coated with ceramic, fired at 1700 degrees. It is oven-safe, can be used on a stove-top or on a grill, is shatter-proof, and uniformly conducts heat for the best baking or cooking results. Available in a wide variety of pieces and colors. 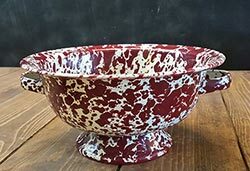 This is for the SMALL COLANDER in the Burgundy marble color, which is burgundy red and cream splatter (see detail photo for sample). Measures 9.5 inches in diameter, 4.75 inches high. 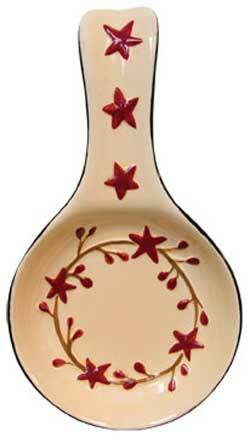 Great for straining pasta, washing grapes, or as a fruit bowl! Heavy stoneware bowls, perfect for mixing batters or serving salads and fruits! Large Lidded Baker, by Tag. 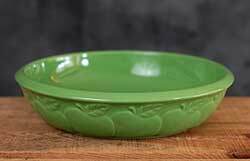 Part of the Victory Garden Collection, this lovely celery green and white covered casserole would be beautiful on any table! Microwave, dishwasher, and oven safe. Measures 6.5 x 9 inches (10 inches with handles); 9 cup capacity. Smaller size also available! In-stock merchandise ships in 2-6 business days :: "Special order" & Made to Order items varies. (See individual listings for details) :: Business days are M-F. Excludes Saturdays, Sundays, and holidays.